Another day has dawned. I actually saw the dawn too. Last night I pondered my plans for the day. I knew that up on deck for my day was the hour of social fun, also known as zumba at 6:45PM. I also knew that should the weather and my husband both be amendable that we would hike or bike in the afternoon after I got off work (at noon today). I have learned to not count on that as a plan because the weather has been fickle and well, my husband is also fickle when it comes to those things too. I just take our walks and hikes as fun activity and not so much as exercise (although it is that). 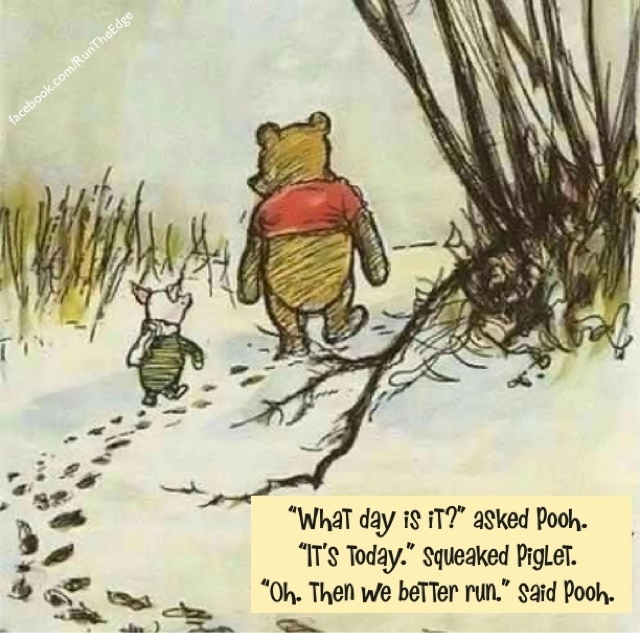 I WANTED to run. This running thing is quickly becoming a thing that I want to do and when I do not do it, it really bothers me. I decided that while my alarm was set for 6:30 that if my body woke up naturally early enough (5:30) that I would go for an early morning run. (This is not too abnormal, because I typically wake up between 5:30 and 6). Like clockwork this morning I woke up at 5:30. I wanted to go running so bad…but my body was sooooo comfortable in bed. And then I saw a post on face book. The picture is posted at the end of this post (I haven’t figured out how to place pictures interspersed into the post while posting from my phone). I was up and out the door within minutes. It was gorgeous….deer were feasting in the fields as I ran in the dusky dawn light. I didn’t push myself too incredibly hard. I hoped and thought that maybe I was going faster but it felt pretty comfortable so I thought that I was simply running at my average pace. I was ok with that. I was also ok with the fact that I knocked a mile off my normal run. I had to get back to my house to shower, for some reason my co-workers want me to shower before I come to work. I finished and looked at my app that tracks my mileage and pace. What????? My average pace was 12:49 What??? Are you serious????? At the beginning of April my average pace was running about 14:50 . Granted, my heart rate was about 10 beats faster per minute but that will drop as it becomes more comfortable for me! Progress! (Now I just need to get that pace to be my consistent pace…and of course get faster!) I am going to beat this running thing yet! Life has been crazy. I’ve had some depression and sadness. (That’s the understatement of the year.) The exercise for me is the way to shut out the sadness and the dark. It’s almost as if when I’m sweating my guts out that I’m shedding some of the sadness, if only for a few minutes. Is this transference of an addiction? I’ll admit it…..it probably is. Instead of eating away my sorrows, I’m going outside and sweating my guts out! Is it healthy? Emotionally, probably not. I don’t know that any addiction is good. Is this addiction hurting me like my addiction to food? No. I’m not doing the exercise thing stupidly. I don’t like pain. So the other morning when I was really achy, I didn’t run. This morning my legs felt fine when I went to the bathroom, so I knew I was ok. So maybe since I’m operating under the guidance of how my body feels I don’t have an addiction. Ha ha ha Regardless…..I’m riding the wave! All I know is that exercise clears my mind. It makes me feel alive and it makes me happy! That's what matters!!! My eating of late has been doing REALLY well. I don't want to say it too loudly because it can change at the blink of an eye, but the food addiction has been safely packed away of late. I don’t eat crazy since I’m exercising. I eat healthy! My calorie counts have been right where they need to be. I’ve been monitoring and limiting my intake of carbs (this is sad…so sad….but necessary) I’ve been eating lots of healthy foods. My diet has been heavy on the fruit and veggie intake. Pounds are lost in the kitchen and my weight loss (6 pounds in the last two weeks) reflects this! I’m eating healthy. I’m living life fully. I am eating out with my family when the opportunity arises, no matter where they go…..I just make the best choices possible and work to accommodate those choices within my caloric budget. I’m happy with where I’m at. It’s a good place. This is life and I’m making it work! I try to take the focus off the numbers. But it’s so difficult to not think about how the numbers are dropping, where I’m heading and when I may possibly may get there. Regardless of how fast I want to lose the weight…my body will get there in it’s own time. Patience MaryFran…..Patience! I used to run a lot, but I got lazy and am now trying to get back into it. Running, especially after you are out of breath and exerting yourself, takes concentration and effort that can no longer be focused on whatever is bothering us or stressing us...at least that is my theory for why it is so therapeutic! Especially with music and good scenery. I don't think running is an addiction until it you start feeling anxiety or you try to overdo it. Exercise is great for a person mentally. As Reese Witherspoon said on Legally Blonde, "Exercise releases endorphins and endorphins make you happy. Happy people don't just kill their husbands." 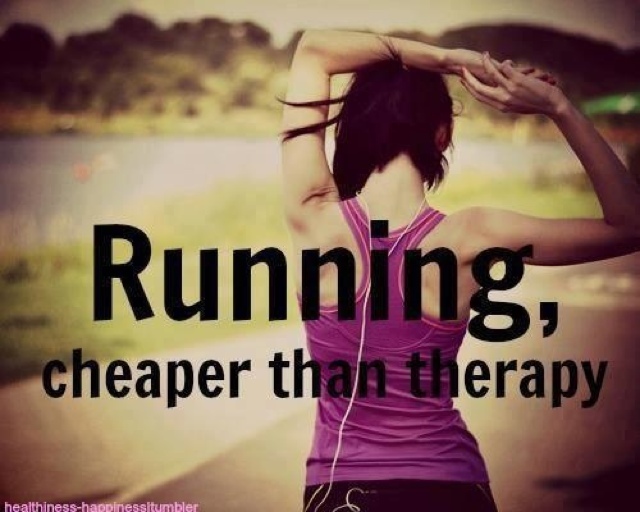 Running is a great addiction! Plus you can focus on new numbers now that are dropping.. your time it takes to complete a mile!! Good for you and keep it up. I think it is possible to have a an addition to running. If you enjoy what you're doing --- it ceases to become exercise and starts being FUN. There's nothing wrong with that unless you start choosing it above everything else --- all the time! Great job on sticking with it by-the-way! You're quite the inspiration! I work in the mental health field, and I have to say that exercise is a really, REALLY good thing for depression. It is recommended, and in fact, I have been trying to get my clients to exercise more. My company will even help them get a YMCA membership if they want it because it's such a good thing. With all the possible addictions, running may be the most healthy one you can have. It's better to be addicted to running than sugar. I'm glad your eating is going well.